Mailing lists are a great way to stay up-to-date with your favorite people, places, topics, and other things. However, sometimes interest in a mailing list goes away. When you no longer want to receive emails from a mailing list, unsubscribe from those emails. There are many ways to unsubscribe from mailing lists and stop unwanted emails from being delivered to your inbox. The method you choose depends on the type of mailing list and your preferences. Select the Unsubscribe link in the email message. This may be the easiest method. After you click the unsubscribe link, you’re automatically removed from the mailing list. Mark an email from the mailing list as spam. This involves setting up rules in your email program to block emails that come from a specific email address. Use an unsubscribe service. When you want to manage your mailing lists in one place, find a unsubscribe service that lists all the mailing lists it finds in your inbox. Use an unsubscribe email app. If you access your email from a mobile device, there are several apps for Android, iOS, and Outlook that automatically unsubscribe you from mailing lists. As you browse through the list of email in your inbox, you may notice an email from a mailing list you no longer find interesting. Mailing lists are required to provide contact information in the email, and many offer an unsubscribe link. Use this link to remove your name from the mailing list quickly. Select an email from the mailing list. A web page opens in your default browser and displays a message that you have successfully unsubscribed from the mailing list. Select Unsubscribe if you are prompted to confirm that you no longer want to receive emails from the mailing list. Gmail provides an Unsubscribe link in the header of an email message from a mailing list. You’ll also find this Unsubscribe link in Outlook Online. In the confirmation dialog box, select Unsubscribe to confirm that you want to be removed from the mailing list. You are unsubscribed from the mailing list, and the email app moves the selected message to the Spam or Deleted Items folder. If unsubscribing from the email mailing list doesn’t keep all the emails out of your inbox, block that email address. Many email apps can block spam from your inbox. In Gmail, select More > Report spam. In Outlook Online, select Junk > Block. In Outlook 2019, go to Home and select Junk > Block Sender. In Outlook Online, select Sweep to delete messages from the sender that are in your Inbox and messages you receive in the future. These emails are marked as spam and are sent to the Junk or Deleted Items folders. 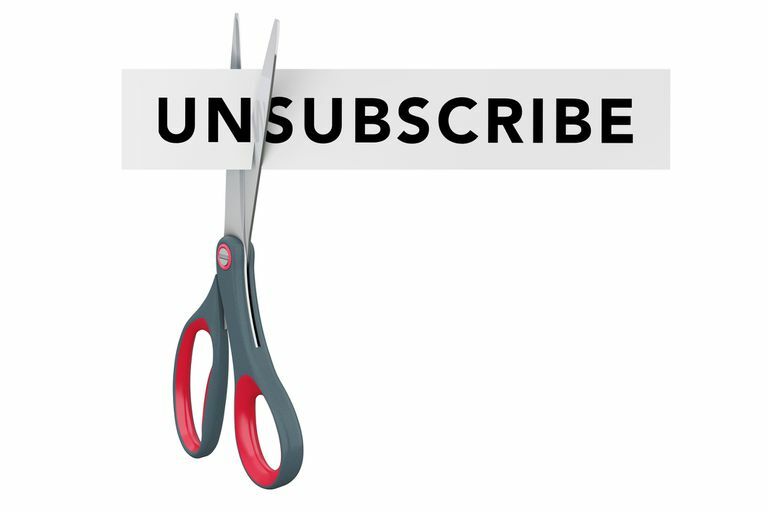 If you subscribe to several mailing lists and you want to clean up your inbox at one time, use an unsubscribe service. There are several websites where you can access all your mailing lists from one place and unsubscribe from a mailing list by selecting it. Unsubscribe services search your inbox to find messages with an unsubscribe link. To use these services, you’ll need to grant these services access to your inbox. One popular unsubscribe service is Unsubscriber. To get started with Unsubscriber, sign up at the Unsubscriber website. After you sign up, an Unsubscribe folder is added to your inbox. Unsubscriber works with Outlook, Yahoo, AOL, and most IMAP enabled mailboxes. Unsubscriber discontinued service for Gmail on March 31, 2019, due to changes in Gmail’s Terms of Service. When an unwanted email is delivered to your inbox, drag it to the Unsubscribe folder. The sender is automatically notified that you want to unsubscribe. Emails from these senders are blocked from your inbox and are stored in the Unsubscribe folder until you are unsubscribed from the mailing list. If you access your email from a mobile device, use one of the unsubscribe email apps to remove your email address from mailing lists. Unroll.Me is a popular unsubscribe email app that lists all of your subscription emails and provides a one-click method to unsubscribe. Unroll.Me also provides a way for you to group your favorite email subscriptions into a digest. Then, instead of browsing for these emails in your inbox, use the digest to find these subscriptions. Unroll.Me has apps for Android and iOS. Unroll.Me also has a free online unsubscribe service. Sign in with your Google, Yahoo, Outlook, or AOL account and Unroll.Me lists emails you’ve received from mailing lists. Just select those emails that you want to unsubscribe.